Yep, that was one of the veggies I served up with dinner tonight. I found them at Trader Joe's in the freezer section.....a bag of sliced yellow and the more familiar orange kind. They have yellow carrots? Who knew? Colored carrots aren't anything new. 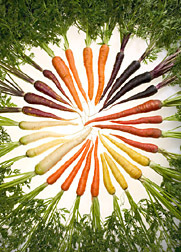 The Agricultural Research Service of the U.S. Department of Agriculture have raised carrots that reflect every color of the rainbow. Purple and yellow carrots were eaten more than 1,000 years ago in Afghanistan and 700 years ago in western Europe. However, in earlier times carrots were grown for their leaves and seeds. The roots weren't as popular as they are today. Tonight I tried this carrot recipe...and it's a keeper! Heat the oil in a skillet over medium-high heat. Saute carrots in oil for 10 minutes, or till tender. Stir in balsamic vinegar and brown sugar. Mix to coat and serve. We served these carrots along with grilled boneless pork chops and aged Indian basmati and wild rice with garden herbs and vegetables from Trader Joe's and a glass or two of their Charles Shaw Pino Grigio. The Charles Shaw label is often referred to as Trader Joe's Two Buck Chuck...very nice table wine at an affordable price!! !